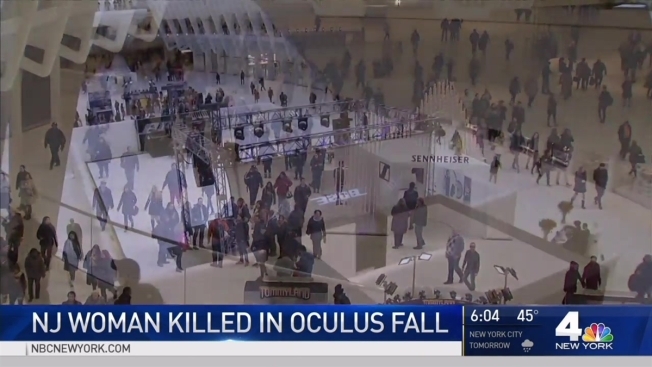 A 29-year-old woman plunged about 30 feet to her death Saturday off an escalator inside the famed World Trade Center Oculus, police said. Jenny Santos, of Kearney, was trying to retrieve her twin sister's hat while riding the escalator at about 5:30 a.m. Saturday, law enforcement sources said. That's when santos fell over the side of the escalator and plunged to the main concourse floor of the lofty transit hub. Her sister wasn't injured. She was taken to Bellevue Hospital where she was pronounced dead, Port Authority police spokesman Joseph Pentangelo said. Police are investigating. Santos' sister accompanied her to Bellevue, where she was treated for trauma, according to a Port Authority official. The official wasn't authorized to speak publicly about the incident and spoke on condition of anonymity. The striking $3.9 billion transportation hub was designed by architect Santiago Calatrava and provides connections between New Jersey's PATH trains and New York City's subways. It opened about a year ago and is used daily by more than 300,000 commuters. Light beams in from the windows in the dizzying, soaring platform to the shopping mall below.